"The Saga Continues" line of figures was Irwin's first 5" DBZ figure series. It consisted of Dorda and AB Super Guerriers re-releases and was launched in 1998 with the "Super Warriors" figures. The packaging featured vacuum formed blister packs on green, blue, black cards with SUPER WARRIORS written up the left side. On the back of the packaging, it only shows the AB figures. The 5 Dorda characters do not appear on the back of their own cards. I *believe* the Dorda re-releases were first released by Haschel Toys, because the copyright text on the back of the packaging mentions FUNimation, Toei Animation, and Cartoon Network, but on the Irwin versions, the back of the cardboard includes those three as well as Irwin Toys. I honestly don't know the history of these, as I hadn't started collecting yet (--Branjita), but I believe this is correct. Something very interesting and unique about these figures is that the colors on the characters actually match (or closely match) the original AB releases. This is the only Irwin release of SS Gohan in dark blue instead of medium blue, and Bardock in dark blue instead of medium blue. It's also the only time you could get Janemba from Irwin. In 1999, Irwin continued "The Saga Continues" series with Bandai Super Battle Collection and AB Super Guerriers re-releases. At first they reused the graphics from the "Super Warriors" line, but without those two words on the card. Then they started using a similar design that had pink and other colors added to the card that looked much fancier. These figures all featured a blister pack that was not vacuum formed; it was square (what's that called...? ). The JC Penney (?) Christmas three packs. Mail order exclusive from their catalog. loki, can you help with info on some of this stuff? 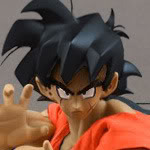 Ive been getting pictures together on www.Dragonballtoys.co if you want some. The pics on your site look great! I'll definitely use them for this list, and I'll make sure the list gives credit to your site. Thanks! Individual pictures of each item would be badass if we can make it happen! I'm not very knowledgeable about the Irwin reissues since I opened them in '98 and just cared about the figures and not the packaging, but do these form fitted ones fit in with a series number or are they not accounted for? I don't see Janemba on your list, and Janemba was only released by Irwin with one rare time as far as I remember. Edit: Actually Boddah, I'm going to upload these pics I have to the photobucket and copy and paste them into your post. I hope you can figure out how to best sort them. Ah yeah I didn't think about the other packaging, knew I was missing something haha. But yeah sounds good, I'll sort that out later. I'm going to make my changes separately, because if you happen to get on here and start editing the same post that I'm editing... one of us is going to end up overwriting the other person's changes. So here's my changes... I'm not an expert on these, but I tried my best. I was in the 8th grade back then so that was a LONG time ago. Awesome I love the changes! I switched out the old list with your edited version. The only thing I didn't keep is the Yo Yo, I feel like that would fit better in another list for misc. Saga Continues items. I plan on making a list for the mini figures, and one for "other". I'll try to fire up the remaining pictures to the sets this week for you guys. There was a bunch if other things they paired with "the saga continues line" as we'll like 3" ab bendables and clips and such. The Goku in a baggie was an item at sunset or sun coast or sunrise records or movie stores. It was released with the VHS ocean dubs way before Irwin was in the picture. I remember buying one around the same time I bought my first set of 97s. There was one on eBay last week. The 3 packs were catalog order only and I think they were from one of the higher end big box stores. Eatons, Sears or jc penny. I remember it being a Christmas catalog exclusive. Nice pics of the arrival movie toy haven't seen that one before. A couple of months ago I had all the pics and everything to complete this list, then my hard drive unexpectedly crashed and I lost everything... Hopefully I can recover all of it soon and finish this list. Oh geez, that's bad news!